Wakeboard ropes and ski ropes are completely different. Ski ropes, you want more stretch. Wakeboard ropes you want the complete opposite, no stretch at all. Why? In order to get some major air off the wake, wakeboarders need to load up the rope. If the rope is too stretchy, you won’t be able to perform your tricks as well. The material you choose for your wakeboard rope will affect the way you ride. 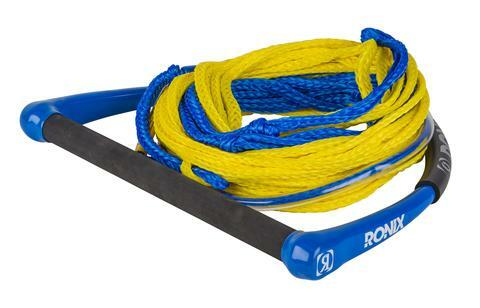 There are 3 main wakeboard rope materials to choose from: Poly E, Dyneema and Spectra. Poly E: This is a low stretch material, making it more forgiving as it absorbs the shock of cutting through the wake which is perfect for beginner riders. Poly E is the least expensive wakeboard rope available. It stretches up to 3% of its length under normal riding loads. If you are a more serious wakeboarder, Poly E is not for you. Dyneema: This material is as strong as a wire and has no stretch. Dyneema performs well in saltwater, has strong UV and abrasion resistance and outperforms steel and other synthetic rope materials. Spectra:10 times stronger than steel, ultra-lightweight, zero stretch and will float, Spectra is a fantastic material to choose if you are a more advanced rider. WHAT’S A GOOD WAKEBOARD ROPE LENGTH? Wakeboard rope lengths vary from 55 to 75+ feet long. A good length for beginners is 65 feet. Once you get more advanced and can clear the wake at the shorter distance, gradually go up in length of rope to be able to clear the wake the wider it gets. With a longer rope you will be able to gain more speed and catch more air when you pop off the wake. Remember, the longer the rope, the more time you spend in the air. Want a large selection of Ski and Board ropes? Shop at our online ProShop. TheWakeShop.com has all the best brands and the best clearance prices online.